What for? So that at last you will see what you did not see. UNRECOUNTED juxtaposes a screening of Christoph Schlingensief’s film The African Twin Towers with Nicola Brandt’s installation Indifference. 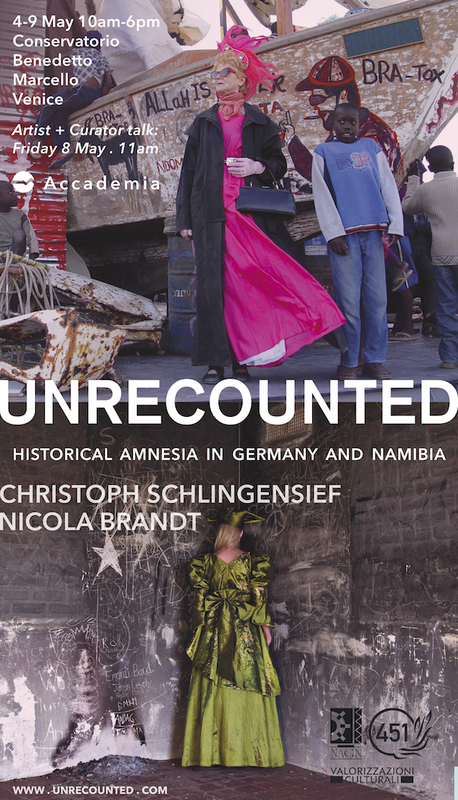 Namibia, with its history of German colonization (1884-1915) and South African apartheid rule (up to 1990), is the setting for both works. In response to Okwui Enwezor’s Venice biennale theme All the World’s Futures, UNRECOUNTED shows two artists who have inherited the legacy of the colonizer. This is the first exhibition at the Biennale to be supported by the National Art Gallery of Namibia. Christoph Schlingensief’s The African Twin Towers (2005-09) is a non-linear documentary film relating Schlingensief’s attempt to stage Richard Wagner’s Ring Cycle in Namibia. Arriving in Namibia, Schlingensief soon abandoned the feature film he initially envisaged. Instead, he erected a rotating stage in the middle of the township Area 7 of the former German colonial town Lüderitz, inviting the residents to participate in construction of new stories. The film is a fragmentary record of these events. Schlingensief (1960-2010) was posthumously awarded the Golden Lion for the display of his work in the German Pavilion at the Venice Biennial in 2011. Indifference (2014) is a video installation by the Namibian artist Nicola Brandt (b.1983). Brandt collaborated with Herero women in Namibia. In the work, a sixty-year-old Herero-Namibian and a ninety-year-old German-Namibian recall a day spent close to unmarked mass graves. The Herero woman narrates the atrocities committed by the colonizers on the Nama and Herero people in 1904-1908. The video plunges us into Namibian landscapes, indifferent to human tragedy. Both works foreground involuntary memory, and the way that unresolved trauma breaks out in everyday engagements. They show the extent to which German colonial guilt has not been dealt with by those who have inherited it. Through their work, each artist interrogates German historical memory and the Romantic tradition that sustains it. The exhibition is curated by Sarah Hegenbart, Vid Simoniti and Adina Drinceanu, and produced by Valorizzazioni Culturali, in co-operation with the National Art Gallery of Namibia and Filmgalerie 451.